Since Voice Trix is online I am a huge fan. I love the „Paul-Videos“ and are impatiently waiting for Paula. I use them in my every day work as a Voice therapis & Vocal Coach and I show them in all my workshops. So first of all „THANK YOU, VOICE TRIX TEAM“. Some years ago I was at a workshop for singers. One of the singers had a cold and was aphon. So she couldn’t do all the exercises the coach teached. After the first day the coach advised the girl to bubble into a bottle of water through a silicone tube. Sceptically she startet as he told her and stoppt after a minute, asking him WITH VOICE „And why should that work?“. 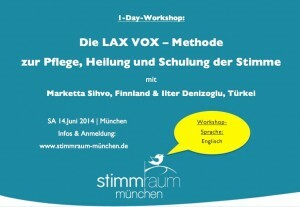 I searched the internet and found an english explanation about LAX VOX by Marketta Sihvo. So i translated it, because I didn’t understand all of it. After I finished my translation I wrote an E-Mail to Marketta and asked her, if we both can talk about some aspects. So we met in Prague at the PEVOC. I although met Dr. Ilter Denizoglu, an ENT, who wrote all the explanations about how and why it works – and as a result of our work I published the german Version of LAX VOX on my website. DON’T MISS IT: **** 14th Juno 2014 ***** – Workshop-Language will be english, because Marketta Sihvo is from Finland, Dr. Denizoglu arrives from Turkey. !!! The one and only WORKSHOP in Germany –> 14.06.2014 Munich !!! I hope you will try LAX VOX and use that voice trix to keep your voice healty, rescue your voice after a cold even train for low or high notes. Everything is possible with that tube.